Brian Thacker Travel Writer | If it’s Friday, this must be Hannover. I’m nearing the end of my book tour around Germany for Couch Surfing: Eine abenteuerliche Reise um die Welt and scheiße am I tired. The tour has been going very well, though, and the book events have been well attended, my couch surfing hosts have been wonderful and I’ve eaten and drunk my body weight in wurst and beer. So far I have been to Frankfurt, Stuttgart, Leipzig and Rendsburg and I’m currently in Hannover. I think. 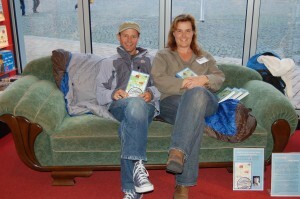 I couch surfed with Bianca and Norman who must be the couch surfing King and Queen of Frankfurt. They have had over a hundred couchsurfing guests in their tiny flat. Bianaca’s third ever guest was Norman from Equador. He stayed a little longer. And they got married! 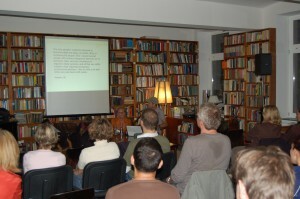 My book reading was at Buchhandlung Schutt, which was a lovely old book shop and three lovely girls from the publicity department of my German publisher Eichborn did the actual reading. Afterwards the gang at Eichborn took me to a bar and we drank lots of beer until late. Frankfurt food highlight: Kalbsbraten (veal) smothered in thick cream and mushroom sauce served with spatzle and salad. 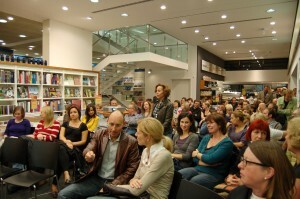 My biggest crowd so far (over 80 people) turned up to my talk and reading at Buchhandlung Wittwer, a fantastic five-level bookshop in the centre of Stuttgart. This time an ‘actor’ did the reading and he even did all the voices and actions. My couch host was the lovely (I’ll say that a lot in this blog entry!) Frau Dutzmann-Schoch who worked at the bookshop. Afterwards we went back to my host’s house and we drank lots of beer until late. Stuttgart food highlight: Maultaschensuppe (a huge stuffed ravioli thing in a beef broth). 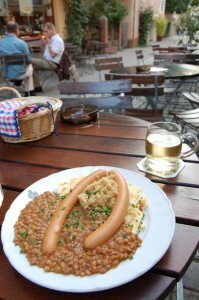 I also had a very nice, but wind making, Linsen und Spätzle (Lentils and Spaetzle and vienna sausage). 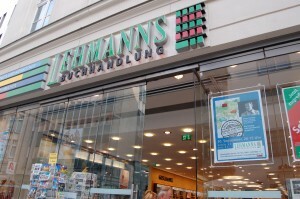 In the beautiful old city of Leipzig in former East Germany I was talking at the very modern Lehmanns Buchhandlung. My couch surfing host Tina and her boyfriend took me to a great old bar from the former East German days that still looked the same (minus the Stasi agents lurking in the corner). Afterwards we went back to my host’s house and we drank lots of beer until late. Rendsburg is a charming little town right up near the Danish border. I thought I was going to have a nice quiet and early night after so many late nights, because my lovely couchsurfing host Ute had two small children. But, Ute (and the entire staff of Buchhandlung Reichel) took me out on a bender with lots of beer and some tasty but deadly shots of vodka and something green. We staggered home some time around 1.30. So, tonight is my last talk (and hopefully not too much beer afterwards) and then I’m heading back down to Stuttgart for the Volksfest (where there will be lots of beer) and then I fly to Bali for the Ubud Writer’s Festival (where I’m looking forward to being in the one spot and doing my best to keep away from too many Bintangs!). Where to go for a Mancation. Clowning around in Frankfurt. From kartoffelpuffers to nasi goreng.